A Charmed Wife: Egg-stra Extra! 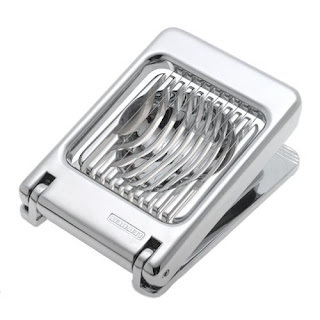 I'm a sucker for a functional kitchen gadget, but my Manhattan-sized (that's a nice way of saying minuscule) kitchen simply can't accommodate every asparagus peeler and Bacon Genie™ that catches my eye. I keep a handle on my impulses with a rule of thumb that I can't buy anything that only does ONE thing (the one exception to this is the coffee maker, the necessity of which is not up for discussion). So when a majestic hard-boiled egg slicer showed up in my lunchtime chopped salad joint, I was faced will competing drives: the one that likes being able to open my kitchen drawers, and the one that wanted a hard-boiled egg slicer NOW. Luckily, I soon learned that this little seemingly-superfluous dynamo actually slices a lot of things: mushrooms, strawberries, and mozzarella bocconcini and goat cheese, to name a few. 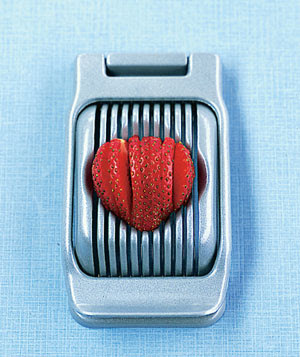 Because it slices with sharp wires instead of blades, food doesn't stick to it, and all the slices are perfectly even. I mean, I'm not throwing out my knife set (let's not overstate the abilities of this sucker), but as far as gadgets go, it's a winner. Unlike, say, the LushLife apple shot glass carver.